I was a 14 year old high school freshman at Klein Oak High School and had just finished working out in my 2nd period PE class. As the other girls and myself began changing for our next class we saw a few of the coaches huddling around a TV. We all thought it odd. A few minutes later they told us the news that two planes had hit the World Trade Center. Our coaches had been outside overseeing our workout when the news broke and were desperately trying to find out what had happened. As the proud daughter of a Houston police officer and granddaughter of a retired New Orleans fireman, the words, “Call your parents” resonated deep inside of me. I knew that my Dad was not working that day, but I was instantly filled with fear. Ms. Courtney had nervously said there might be another attack in other major cities. Would Dad get called in to work? What if the terrorists hit downtown Houston (my Dad’s patrol area) next? While I knew that my fellow classmates were scared and confused like myself, I also knew that they could not be feeling the same as I did at that moment. We watched hundreds of civilians in the streets trying to run away from the disaster and simultaneously saw police officers and firemen running towards the towers, my heart swelled with pride and dread all at once. I remember that my thoughts turned to Pearl Harbor and WWII. I have always found WWII history fascinating and I realized that this could be the beginning of another World War. I knew before the official news statements that our country would be at war after such an attack. Would my friends be drafted in a few years? Is this going to become World War III? Let me rewind for a moment, my family had been living in an extended stay hotel during the summer of ’01 due to some damage in our family home. September 11th was a day that I was anxiously waiting for. It was the day that I was moving back home, back to my own room and back to some semblance of normalcy. I knew then, things would never be “normal” again. When I got home from school that day, the hug that my Dad gave me meant more than usual. Mom and Dad had set up our TV amongst all of the boxes in our living room so that we could watch the coverage. We watched the looping footage of Tower 1 and 2 fall into oblivion, the burning Pentagon, and the brutal wreckage of Flight 93. In the weeks and months that followed, I was so proud of how we came together as a country during a time of tragedy. My parents always flew a flag in our front yard and now the rest of the block joined them. In June of the following year, our church went on a mission trip to NYC. 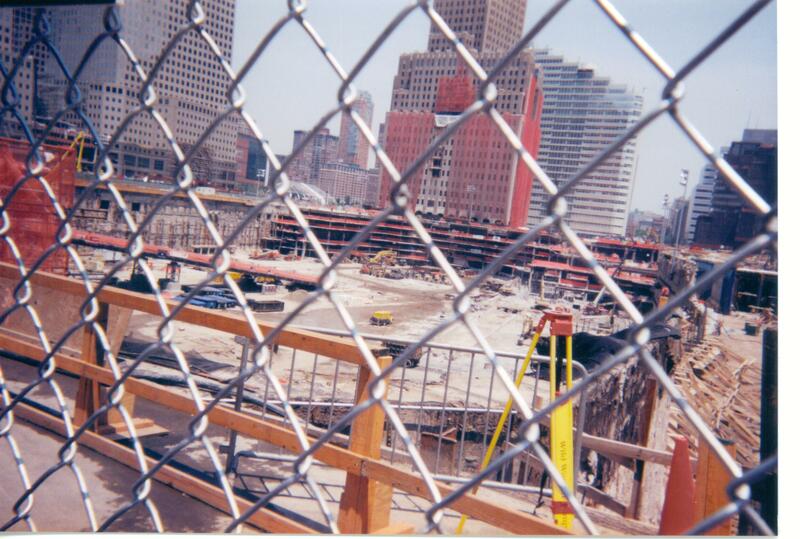 We spent an entire day at Ground Zero and it will always be one of the most emotional days of my life. It was a very surreal day. Friends embraced and cried together but in the midst of it all we each had solitary moments of personal grief for those who lost their lives. I walked through part of Ground Zero with my friend Niki, the daughter of a Houston firefighter, and one of our chaperones, Mrs. Cathy, the widow of a Harris County Sherriff’s Deputy. We did not plan on walking together, but as Mrs. Cathy pulled Niki and I towards her there was an unspoken bond between us. Mrs. Cathy had lost her husband in the line of duty and Niki and I both knew that our fathers could have been among the fallen had circumstances been different. We only walked together for a short time, but that walk meant so much to me. I walked through the piles of flowers, walls covered in missing person signs, and read the still primitive wall of names with tears flowing down my face. As I type these words my eyes are filled with tears again. I am so proud of the country I am lucky enough to call home. I am proud of those in our armed forces who put their lives on the line to protect our freedom. I am proud of the police officers, firefighters, and EMS workers who protect us here at home. I am proud of my Pop for his 25 years of service firefighting. I am proud of my uncle for his 15+ years of service as a police officer. And I am so proud of my Dad for his 18 years of service. Join me in prayer today for those who lost loved ones 11 years ago. Wow! What an impacting blog !! I read it to Pop and we were blessed by your account and your own personal thoughts and feelings concerning what happened. Thank you for taking time to write about it all. We love you. You did an unbelievable job recounting this life changing event. I did want to remind you that I was not the only officer aciting as a chaperone on that trip. After being there for a while we got together and we were sharing our feelings as we stood there. I looked into their eyes and asked, if knowing and seeing what happened here if a plane were to fly into a building near by at that moment, would you hesitate to run to help. Without exception or a second thought everyone agreed that we would be running to help in any way we could. When God calls you to be a publis servant, he plants that calling so deep into your being that your concern and desire to help those in need always outweighs you concern for yourself. Knowing this, it made standintg there so much more potent. We realized that even if they knew what was going to happen those firemen and officers that responded that day still would have done what they did to save others. That is what makes them HEROS!